With Oldham’s crime rate soaring and its local court’s set to close under the latest round of government service and spending cuts would it not now be prudent for Oldham Council to finally publicize the crime increase rather than continue its endless onslaught of sanitized rose tinted press releases. In today’s official crime statistics release we see that in the year to June 2015 domestic burglary fell by 1% across Greater Manchester but increased by 39% in Oldham. 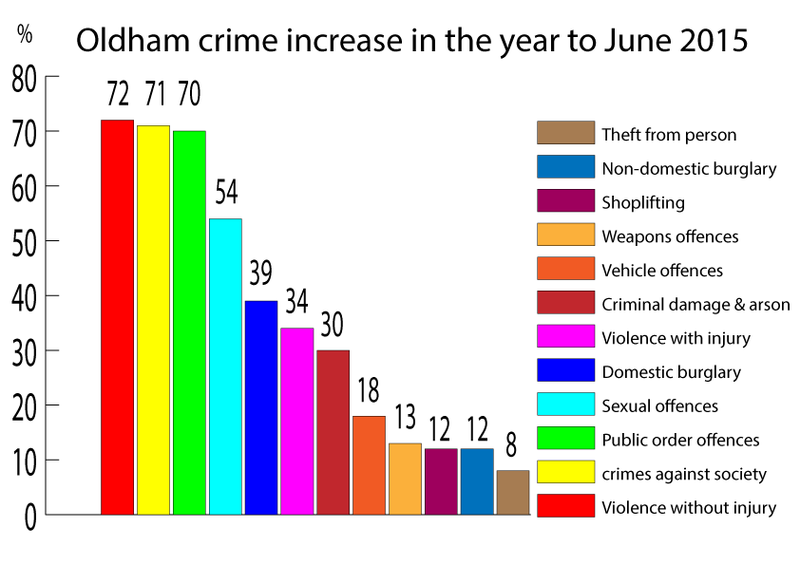 Other crimes on the increase in Oldham include violence with injury up by 34%, violence without injury up by 72%, public order offences up by 70%, Miscellaneous crimes against society up by 71%, sexual offences increased by 54%, criminal damage & arson up by 30%, shoplifting up by 12% theft from person up by 8%.